Unlike traditional courses where learning occurs mostly during fixed class hours, the iPodia learning is continuous throughout the entire week. 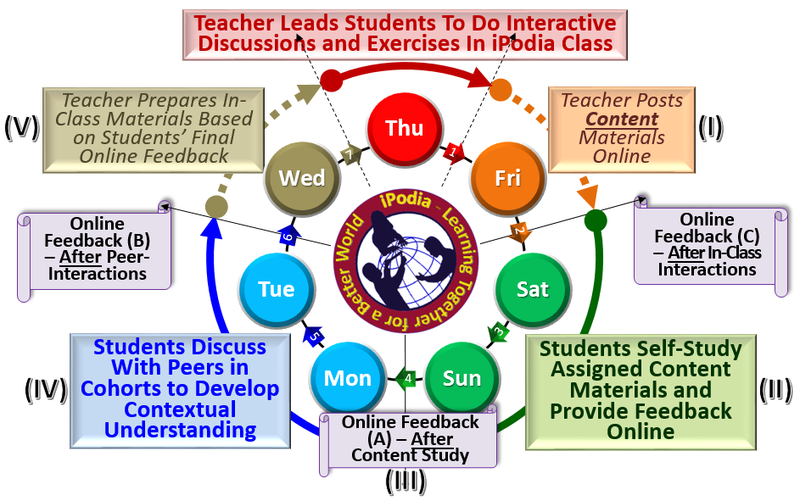 The iPodia platform guides students through a 24/7 learning cycle via inverted learning and peer interaction. 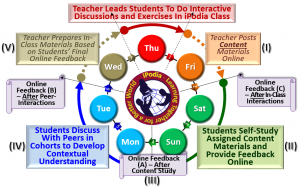 iPodia goes beyond the traditional flip-classroom approach by exploiting feedback from content studies in inverted learning to strategically guide peer interactions for students to acquire contextual knowledge and mutual understanding. The feedback information is used by the professor to identify student learning progress in pre-class studies to properly design in-class activities to maximize students’ overall learning outcomes. The feedback information also reveals students’ different experiences and perspectives toward pre-study materials so that learners with diverse or complementary backgrounds can be assembled as peer-learning cohorts. Lastly, the feedback information is analyzed strategically (i.e., peer analytics) to establish relevant contexts that are used to guide peer interactions among cohort members and create meaningful personalized learning opportunities whenever possible. guided by relevant contexts, and “rewarding” for participants to benefit from their efforts with cohorts. In this way, the diversity of students’ backgrounds is no long an administrative hindrance to be minimized, but rather a valuable learning resource to be maximized.